Here comes the time to reveal the mystery of our haunted house opened to visits since our last chronicle. Here are the same walls actually flying over the sea. Where does it come from, this wall vanishing in the air instead of stopping our wander? What is it made of for being nothing as we go through? A myriad of pixels stand in front of our illusions. 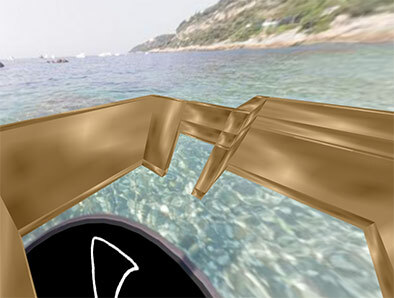 As a matter of fact, this UFH (Unidentified Flying House), flying over the sea in a 3d panorama of the French Riviera, has exactly the same texture as our 3d mushroom presented last October so far as it has been built with the same software Blender. In Blender, we draw vertex by vertex a complex 3D object and apply a texture on it, we convert it in a Collada file that flash can read. Then we can create our interactive web application in ActionScript with Papervision3D. We import the class corresponding to Collada objects and redefine a new material that will constitute the texture of our walls. Every enigmatic question about our haunted house isn?t quite revealed by these technical explanations that some of our readers would find a bit esoteric. Let the mysteries fly in virtual space of the supposed questions of our readers and let fly as well upon the sea our haunted house that we can see under every corners by looking all around, turning our eyes in such a perpetual dance between the beach and the horizon line where our illusion of a closed universe gets vanished.